I don't know about you but I live in black clothing all the time, especially during the colder months! I feel like no matter what, black is just flattering on any shape or size and whenever I wear black it makes me feel more confident within my body. Let's face it, if there is one thing we all have in common, it's that we have an item of black clothing hanging at the back of our wardrobe! Whether that's a LBD, some black jeans or a black bodysuit, there is a staple item of black clothing that we all reach for on a regular basis. 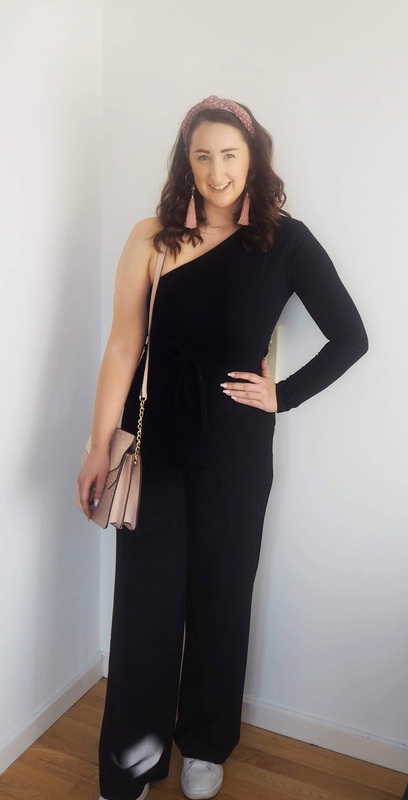 Wearing all black can sometimes look a bit bland and I often feel the need to spice it up, so today I'm going to share with you 5 ways you can inject some sass into an all black outfit. One of the best ways to spice up a black outfit is to add a pop of colour using accessories. This could be with your shoes, jewellery or handbag! I love this Black Belted One Shoulder Jumpsuit (Size 12) - £19.99*. It gives me such a beautiful silhouette shape and is way more flattering that I thought it'd be. The material is stretchy and it's really soft on the skin so it's very comfy. I have dressed this down with white trainers and paired this with blush pink accessories. The handbag and headband are from Primark and the earrings are from Topshop. I think this would also look amazing with red accessories too - especially on holiday with a tan! When wearing black, you don't always have to cover up! I often like to slap on the fake tan and get my legs out in an LBD or skirt and turn a black outfit into something chic. I love this Black Digital Number Print Slogan Tee (Size M/L) - £5.99*, it's so simple yet it can really add something to an outfit. I like to pair this with my black leather paper bag waist mini skirt from TKMaxx and my black heeled boots from Primark. It really makes the outfit that bit more edgy and you can dress it up or down by switching the heeled boots for trainers! I love how versatile this outfit can be! Layering up is such an easy way to style out a black item of clothing. I picked up this Black Give In To Me Oversized T-Shirt Dress (Small) - £9.99* which is not normally something I'd go for as I find that jumpers can sometimes swamp my figure, however I thought this would look really nice layered over jeans (you can find these blue ripped denim in Matalan for £16) with some chunky white trainers and then a long coat over the top. I think this jumper is such a good pick for £9.99 as you can wear it as a dress *only if you're small though because us 5 ft 9 gals would be showing too much cheek* or as a oversize jumper over jeans or leggings! It's so easy to dress up or down too as you can wear it with trainers or with heeled boots! I got the size small which is a good fit and I'm normally a size 12. The final item I picked up was the Black Faux Leather Leggings (Size 12) - £18.99*. They were a big risk for me as I usually have to size up in trousers and am always VERY skeptical when ordering online. I have also never ever felt confident enough to wear leather pants but thought "hey, why the hell not!!" For sizing reference I picked up a 12 which was the biggest size they did (which is a bit annoying for us normal sized gals but I was feeling optimistic). I was actually really pleasantly surprised that they fit me, and felt comfortable too! As they're leather look leggings I think they look amazing paired with different textures. 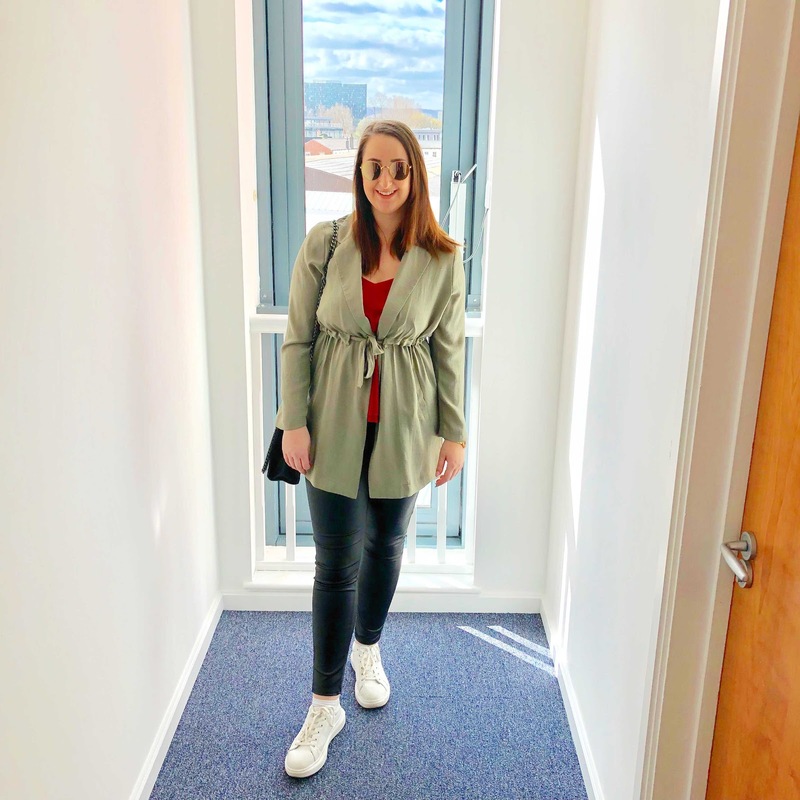 I have paired them with white trainers, a red cami top and my Khaki cotton lightweight coat and I think it looks like a really stylist but effortless outfit! I also switched out the trainers for my black heeled boots to turn this into a night out outfit! You can also wear them with different prints too. I also paired them with a leopard print bodysuit which definitely makes me feel like I'm bringing out my Spice Girls vibes! What's your favourite item in this haul? How would you spice up all black? Let me know in the comments below! I love doing all black outfits with a little pop of colour here and there!